"Yummy potatoes that can help to fill out a meal for a table full of hungry teenagers. Potatoes can be cooked until just done or cooked to a crunchy skin. Great either way." Preheat oven to 350 degrees F (175 degrees C). Line a large baking sheet with foil. Toss fingerling potatoes, onion, coconut oil, garlic, and sea salt in a large bowl. Spread mixture onto baking sheet; bake, stirring every 10 minutes, until potatoes are tender, about 30 to 40 minutes. This is easy to make for one person or a large crowd by adjusting the portions. No measuring is needed. Excellent! I would have never thought of adding the garlic. We will make these again thank you! Nothing here worth repeating. Cook time was 20 minutes longer than the recipe indicates messing up timing. The added ingredients added no flavor of notice to me and my guests. I've used this recipe so often and vary it each time. I've never been disappointed! Olive oil also works great! I loved these!!! The coconut oil is wonderful! I added some roughly chopped parsley, and it was even better. Thanks for sharing this recipe! Really good and easy! There were no leftovers. I appreciate the fact that coconut oil is healthier. 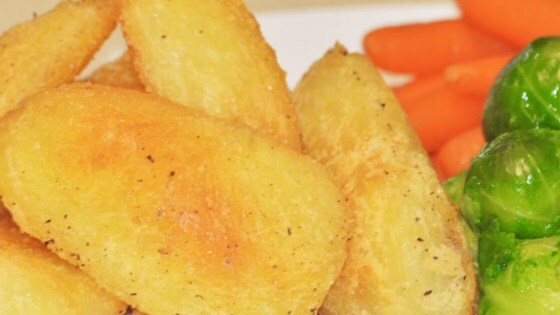 These are wonderful with the coconut oil, adds a whole new dimension on oven roasted potatoes. I also had some fresh parsley to use, so I chopped some up and tossed around.